It is hard to imagine that any other single invention has so impacted a sport like the compound bow has influenced archery. 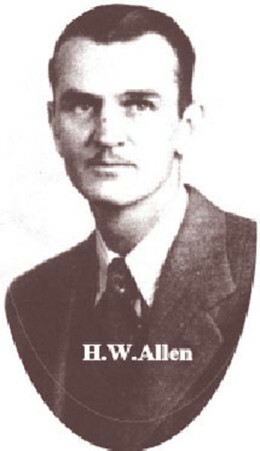 But Holless Wilbur Allen's new bow design did just that - it revolutionized archery and bowhunting. The invention didn't come easy. Allen, like many bowhunters, was frustrated that whitetail deer could jump out of the way of his slow-moving hunting arrows. He set about trying to increase arrow speed by building bows that incorporated his ideas. He built a long-handled bow with very short, extremely recurved limbs. Nope. He tried shooting a short, light-weight arrow down a track attached to his bow and got a little increased speed but poor penetration; this bow broke in testing! After reading up on kinetic energy in his youngest son's high school physics book, he mounted a small standard aircraft pulley into the notched ends of a homemade bow with its recurves cut off. With a very long bowstring he'd made, he formed a "block-and-tackle-like" arrangement on this bow, with the rear string span as the bowstring. Again, no improvement. Other ideas were tried, but nothing gave him the speed he was looking for. Wilbur Allen loved devices and was driven to understand how they worked. At one Christmas dinner, he completely disassembled his oldest sister's new 35mm German-made reflex camera, parts laying all over the dining table. His wife was frantic with what she saw happening, but after grasping how it worked, he reassembled it in perfect working order. His sister never knew. The mechanical knowledge gained from years of such curiosity was used to build what he could not afford. Income came from a business at home making basket frames of steel wire for the nation's florist industry. All equipment for this was built by him, including a machine that straightened steel wire from a 200-lb. coil and cut it to selected length, automatically. It was built from the parts of two washing machines bought at a junk yard and assorted stuff at home. The commercial equivalent at the time cost $50,000; his out-of-pocket cost was $20. He also loved hunting and fishing. When he learned about paddlefish, he could not afford the necessary deep-sea rod and reel, so he built them, too. Using scrap steel wire and sheet metal, the reel was an open-faced spinning design with the crank aligned parallel with the rod and operating a V-belt drive. Reel drag was adjustable by a built-in tensioning device for the V-belt. Such was the innovative spirit that drove H.W. Allen to spend hours contemplating a bow that would shoot arrows faster. It really comes as no surprise, then, that lightning would strike one evening in 1966 while he was studying his pulley bow. "What if," he thought, "I positioned the pulley's pivot hole off-center?" That was it! 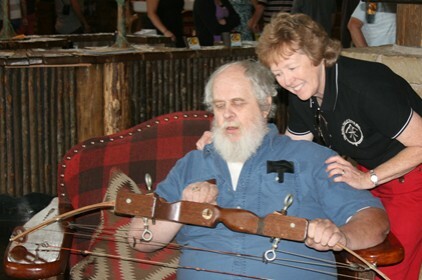 Within two days, Wilbur Allen had built the first compound bow. It was crude - the eccentrics were of wood, the truss handle made of pine boards, limb cores of oak flooring that he laminated with fiberglass roving, all held together with epoxy, nails, a few bolts and a little Elmer's glue. But it worked! He achieved a significant increase in arrow speed over a recurve bow of equal draw weight, relaxation of draw weight of 15%, and the ability to use lighter arrows than the equivalent recurve. His bow design produced impressive performance. Allen filed for a patent on his new bow on June 23, 1966. It was granted in 1969. By 1977, there were 100 different models of compound bows available, only 50 recurve models. After only ten years of production, two thirds of the available choices were compounds. Holless Wilbur Allen had laboriously contrived a rather complicated device that performed a relatively simple task - shoot an arrow fast. He fought hard to get approval from state game agencies for its use in bowhunting and succeeded. Likewise, competitive archery organizations finally approved the compound for tournament shooting.